When we got there, Craig was just finishing the welding around the stern (which has to be water tight we must add) and a fine job he made of it. Jim has really helped out with fitting extra bits and pieces, like he fitted a 10mm steel brace to the engine bay with stabilizer braces to help on the vibration from the engine. From this shot you can see the radiator is fitted and Jim is going to extend the Diesel tank which will fit around the swim, just above the radiator. The well deck has been dropped down to as low as it can go, and is now in. Jim has now got to put in the lockers which he had left, because he wanted to confirm with us their final position. We are so pleased with the progress so far, and we know Jim and Craig were too. This gave us a good feeling as we left for the IWA festival at St Ives. And what a mud bath it was !!!!!!!!! We ended up taking our shoes off and stomping around in bare feet, nice!! We didn't feel like buying anything because it would have got so muddy, and we certainly didn't want to stomp around in those poor peoples new boats. You would have thought some straw or matting could have been found earlier. but, we still enjoyed the day and had a good look at all the boats along the river Ouse, chatting to everyone including Sarah on n.b.Warrior..........Hi Sarah nice to meet you. We are going up to see for ourselves the progress, but its great to see pictures before we go up. This weekend we're off to the IWA at St Ives, with a list of items we need to buy.... so if anyone else is going let us know and we will meet up for a beer or two. As for the house, we have been doing some decorating Uuk!, and a bit more sorting for the house contents sale. We will update more over the coming weekend with the latest pictures. Going up for a swim! 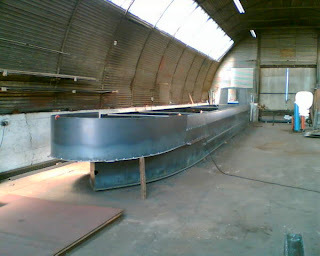 Derwent6 is now built up to the swim, the swim being the fish tail bit that goes on the stern. We could not wait to get up to Jim to see the progress and was pleased with the quality of workmanship. As for the Bow, he has now done the gas locker table and the fancy nose lines. It is all taking shape nicely, but Jim still said he has to straighten her up before the stern floor and cabin sides can be fitted. You can now see the 65 foot length and there is still the stern deck to be added. As you can see the Bow bulkhead is now up and Jim has added in the extra lip on the bottom of the doors as we are dropping the floor as low as we can get it. We still can't believe this will be our home, but the good news is it did look long in the workshop. You can see the shape now coming together. You won't need to put a spirit level against the bow bulkhead, as you can see it's square by this picture. This is Al dreaming that Derwent6 was finished. As for the house we are busy decorating rooms and sorting out solicitors. We will be back up to Alexander Boats, Friday week........ more then ! !